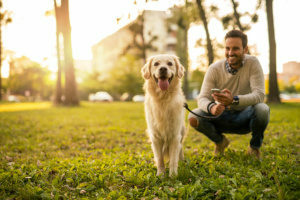 The days are getting longer and the weather is getting warmer, so you and your dog are probably ready to finally escape the monotony of your home and venture out into the world again. It is easy to fall into the pattern of walking the same route every day, but there are so many hidden gems right outside of your neighborhood that you could be missing out on. Here are ten of the best dog-friendly spots for you and your pup to check out on your next adventure. Visit some of these parks with your dog in Centreville to enjoy the sunshine and let your dog make some friends! If you are looking for the perfect place to bring your whole family on a hot summer day, this is it. Cub Run Stream Valley Park has five miles of paved trails situated on 800 acres of flat wooded land. During warmer months, visitors report that there is plenty of shade so you can stay comfortable during your visit. After taking a walk, your kids and your furry friend can take a dip in the creek to cool off before you head home. This 650-acre park has four miles of trails that are open from sunrise to sunset, so it is easy to fit a walk into even the busiest schedules. The trails span a wide range of terrain including bottomland forest areas and meadows, but they also cross marshy pond areas. These pond paths make the perfect backdrop for photos of you and your furry friend. If you visit in the morning, your pup might catch a glimpse of a turtle or a frog hanging out on the lily pads. The property also has a rich history, changing hands three times around the time of the Civil War, so be sure to look for landmarks such as a mill, a miller’s house, and a smokehouse on your walk. This dog park is a wonderful place for your dog to spend some time off leash socializing with other dogs. The park is fully fenced, and there are designated areas for smaller dogs so they can play with friends who are a similar size. There are many parking spaces and benches, so this park is human-friendly too! Visitors have noted that this park is well-attended, clean, and has bowls for the dogs, so all you need to bring is your pup and some water. It is officially brunch season, and several restaurants in Centreville are offering outdoor accommodations so your dog can join you from mimosas to mango frozen yogurt. This breakfast restaurant features a wide variety of egg-based dishes, traditional breakfast staples, and a patio that accommodates the furriest member of your family. Multiple Yelp reviewers have noted that the staff at this establishment goes out of their way to welcome both you and your dog to ensure that your whole family has an enjoyable experience. Little Italy Deli and Trattoria serves classic Italian dishes, and is family owned and operated. They have multiple outdoor tables where dogs are welcome. If you are in the mood for a casual place to watch a sports game and eat traditional sports-bar style food like wings and burgers, be sure to bring your dog to Glory Days. The Centreville location has twelve outdoor tables where you can cool off with a beer and your furry friend. Sweet Frog’s Centreville location is the perfect place to visit after a busy day of fun in the sun. 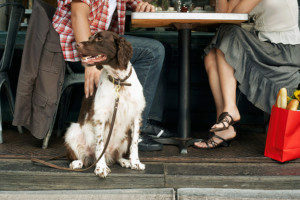 You and your dog can relax with some frozen yogurt at any of the outdoor seating options. Did you know that frozen yogurt is dog friendly? Yup! It contains less lactose than ice cream which makes it easier for dogs to digest, so your pup can enjoy a treat at Sweet Frog too! Do you have plans to travel or a busy schedule? Don’t let your dog miss out on the fun! Using pet sitting services is the best way to keep your dog included in all of the warm weather activities when you are not there. To schedule Centreville VA pet sitting services, contact Paw Pals today.